Summer is around the corner, and with it comes barbecues, lazy days by the pool, and of course, outdoor sports. 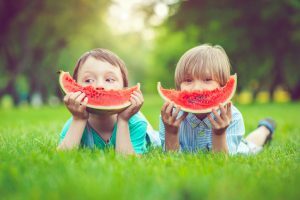 While you are enjoying the warm summer sun, you might not be thinking of the effect the summer might have on your teeth. Read on to learn how to protect your teeth from damage this summer, as well as what to do in an emergency. Whenever you play sports, wear a mouth guard to protect your teeth. You can pick one up from the store, or you can have one custom made by your family dentist in Naperville. This will protect your teeth from getting chipped, cracked, or even knocked loose. It can also protect from potential injury due to clenching your jaw. Summer picnics and hot days often lead to grazing on sugary and starchy foods such as ice cream, soda, and chips. Remember to brush your teeth even when you are out and about, especially after eating sugary foods. If you don’t have a toothbrush handy, rinse your mouth with water or swish some mouthwash around. While you are out on your summertime picnics or barbecues, you may be tempted to munch the day away. Be cautious when snacking, as continuous eating exposes your teeth to decay and erosion. If you don’t take care of your teeth, you might need to make an emergency trip to the dentist. Do NOT use your teeth as tools this summer. This includes opening bottles with your teeth, chewing on ice, opening packages, etc. This will damage your teeth over time. Call your Naperville family dentist! They can help talk you through the necessary steps to save your tooth. Retrieve the tooth or any pieces of the tooth as soon as possible. Rinse off the tooth if it is dirty, but do not scrub it or remove any tissue. If possible, try to place the tooth back into the socket (make sure it is facing the right way). If this is not possible, keep the tooth’s root wet by immersing it in milk or water with a little bit of salt. Stop any bleeding by holding gauze to the area. Get to a cosmetic dentist in Naperville as soon as possible. For more information about emergency dental services, check out our emergency services here. If you have any questions or concerns about your teeth, schedule an appointment at Sherman Oaks Dental, one of the best dentists in Naperville, today!